I discovered my all-time favourite short story writer, Lorrie Moore, entirely as a result of a quote on the cover of her first collection, Self-Help. I just googled the book to find an image (see left), and was struck by the fact that every other edition has appeared with tasteful and sophisticated covers, whereas the one in my local bookshop… Dear god, that is so 80s. Would I ever have bought such a thing if it hadn’t come with an endorsement from one of my favourite novelists, Alison Lurie (incidentally, if you haven’t read The Truth About Lorin Jones, it’s a perfect exposition of the unreliability and subjectivity of the past, and the dubious motives of those who investigate it)? 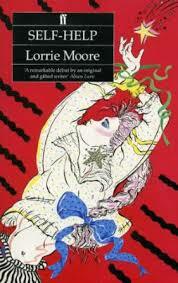 “Lorrie Moore’s wry poetic stories of love and loss make me want to laugh and cry at the same time”. This is more than the sober judgement of a reviewer (though for all I know the quote was taken from a review), and far more than the “You listened to Godspeed You! Black Emperor recently. Want to try Crippled Black Phoenix?” algorithms of Spotify and its ilk. It builds on the sense of a shared sensibility with a writer whose books I love; it’s not suggesting that this new work is the same as or even similar to books I already know I like, but rather that someone whom, in a sense, I feel I know through her writing, thought this was the sort of book I might like. There is, I suppose, a sort of implicit claim to authority, that this is someone whose critical judgements ought to be taken seriously, but it’s grounded in Lurie’s own achievements (contrast the way that many reviews are cited by the newspaper or magazine rather than the reviewer; what matters here is the authoritative imprimatur of the publication), and leaves it open to the casual browser to feel that if Lurie likes it then it’s definitely not for them – in the way that I would never buy a book if I thought there was any risk that Jeremy Clarkson or Toby Young liked it, even if they hadn’t actually supplied a quote for the cover. All of which leads me to wonder about the increasing prevalence of pre-publication blurbs on academic books; not the old practice of quoting from suitably positive reviews when the paperback edition appears, but – since so many books are published simultaneously in hardback and paperback these days – the quotes that come from people who’ve been sent the proofs to read so their glowing testimonials can be used for the initial publicity campaign. Am I the only person who finds this all slightly odd?